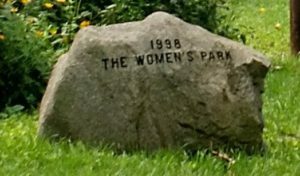 A few years back I was asked if I would object to relocating my father’s memorial tree, which stood at the edge of an area that was to become the Women’s Park in Yellow Springs. The reason, I was told, is that the park was devoted to celebrating the achievements of women exclusively. This pursuit of gender purity did not resonate with me, but particularly the idea of revoking the memorial character of a dedicated tree did not feel right. I think memorial trees belong to sacred space, almost like tombstones. For that alone, they should be respected. This situation brought back memories of Columbus, Ohio. When I lived there, I frequently drove on a highway that, curiously enough, had a cemetery to either side of it and opposing each other. I let my imagination create scenarios of how in the olden days the two cemeteries might have come into existence side by side. Perhaps one was for whites and the other for blacks, or one was the Protestant cemetery and the other was Catholic, or maybe the smaller one was for the rich people. Little did I know that the explanation was much more prosaic and contemporary. Once an undivided graveyard, it was split into two when the highway was built. I can’t, nor do I want to, remember what they did with the unlucky graves that stood in the way of progress. My father’s poor tree standing in the way of the creation of the Women’s Park made me think of him and of what the park would honor. My father was part of a generation that knew no feminism. Progressive thinking, for them, was at best to agree with the women’s right to vote. He never cooked, did the laundry, or changed diapers. He didn’t even brew his own coffee. However, he had his own non-mainstream ideas about gender roles. At a time and place where woman doctors were a rarity, he pushed my mother through medical school. Mandatory anatomy training included such unladylike things like weekly, gruesome dissection of cadavers. With his help my mother graduated, with me crawling around and my brother in the making, one of eight women in a class of 2,000. And, though my father never stopped wanting her to warm up his coffee, he supported my mother’s working outside the home throughout their life together. So, the Women’s Park came all the way up to my father’s memorial tree, which now stands right next to it. If there is a heaven, my father must be pleased with his tree’s neighbor. It is in fine company.